I’ve got The Conscious Cook by Tal Ronnen in my hands right now. Yes, it is a two year old book, but he is still making news. I hadn’t heard of him before because I wasn’t following vegan blogs, and really don’t have that much time. So I didn’t catch reviews by those of you out there talking about the book. That’s how I missed the news of a hot new chef making waves. I cracked the book. It has a gorgeous layout, and it’s hefty, which means it is printed on good paper; and, it has great, no, stunning photographs. I began reading. His pantry list is limited, but descriptive. The restaurants he lists in the back are ones he helped. And then come the recipes. The book follows the classic layout, starters, salads, soups, entrees, and dessert. Then suggested party menus; eating seasonally and favorite vegan restaurants. 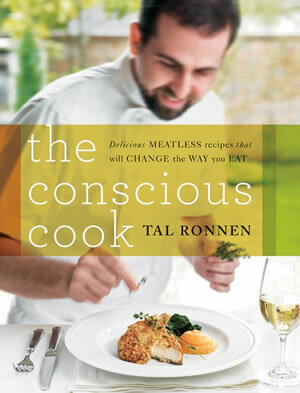 I wanted to know what makes Tal Ronnen the Conscious cook. I know why I am the Kitchen Shaman. There is a spiritual element in my cooking. I make magic with flavors and textures, and tempt you to not only eat healthy, but also eat well. Ronnen is doing the same thing, “Delicious meatless recipes that will change the way you eat.” But in reading the book, aside from his interviews with chefs and product guys, I did not find evidence of his being a conscious cook. It’s a good thing I am a chef, because with each recipe I was asking myself, what would the beginning cook know about minced or chiffonade, braising, or basting? 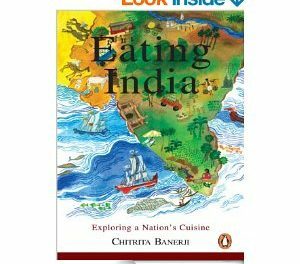 Each recipe, though beautiful and filled with high end ingredients to tempt even the hardiest foodie, comes across as pretentious. Yes, pretentious. When I read Live to Cook by Michael Symon, it was down to earth. He told you how you can make things at home. What techniques to use that transfer from a commercial kitchen to your home kitchen. Ronnen doesn’t even offer this tidbit. This is a chef’s book. A book to read and say, “how pretty, if I only knew how,” and leave on the shelf. It does read well, and I enjoy the context of the recipes. But does Ronnen know that regular sugar is not vegan? Did he let the reader know to use vegan sugar not the white refined stuff? Does he know that there might be issues about vinegars being clarified through egg whites? (I’m trying to clear up this issue right now because I love different vinegars). Yet vinegar, agave nectar (another disputed food item because of the way it is processed), and sugar are some of his main ingredients for salad dressings and marinades. 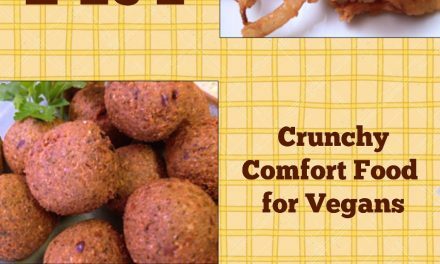 This is considered a transitional diet cookbook, meaning those who don’t think they can live without meat can try these recipes and still find flavor and crunch. Still not miss the fat and grease of a meat-based diet. I doubt I’ll try any of the recipes. I thought briefly of testing each one, but it isn’t going to happen. And I don’t mean to be so hard on someone who is working toward educating people about a meatless diet. But Tal, next time you write a cookbook, maybe you could bring it down to the home cook’s level, and maybe give us a few directions on technique.